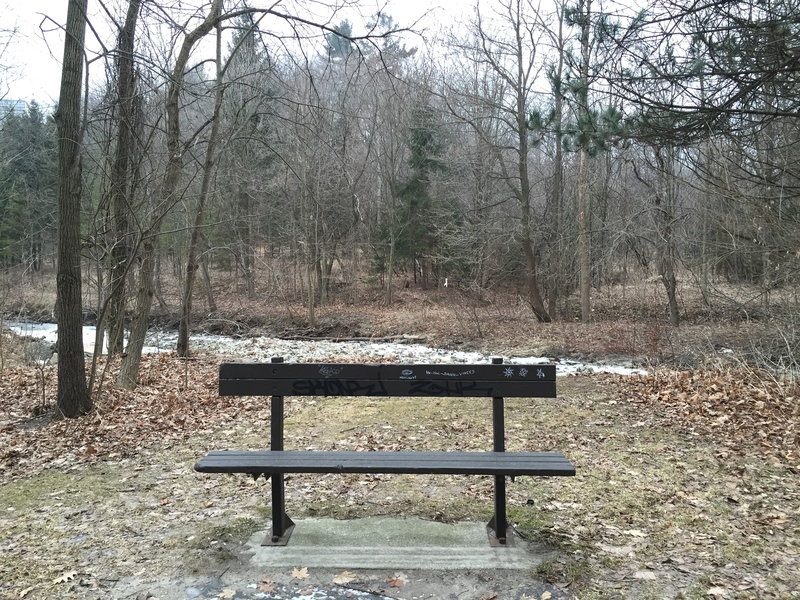 While in Ward 35 in Scarborough to check out Victoria Park-Eglinton Parkette, I thought I would balance out visiting a small park surrounded by roads with a walk in a deeply cut ravine–Warden Woods Park. It’s also right on the subway line (the entrance is across from Warden Station and the other end is near Victoria Park Station) so it was easy to get there. 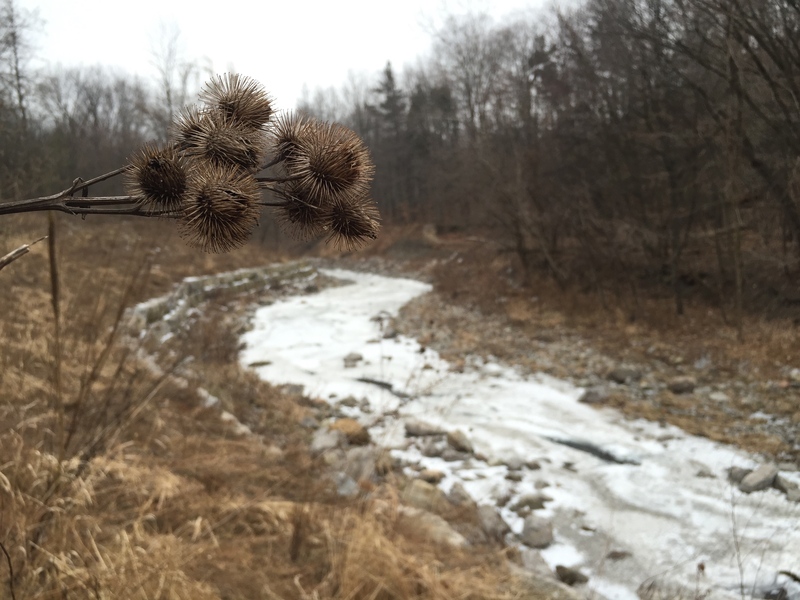 Warden Woods is part of the Don ravine system and on the Taylor-Massey Creek. It’s a pretty big spot, 35 hectares in size, and, according to a park sign I came across, contains forests that are “approaching old-growth conditions, with rare understorey plants.” The ravine did have a lot of cool looking plants and things sticking up everywhere. I especially liked these reedy plants with the nifty spiky balls on them. 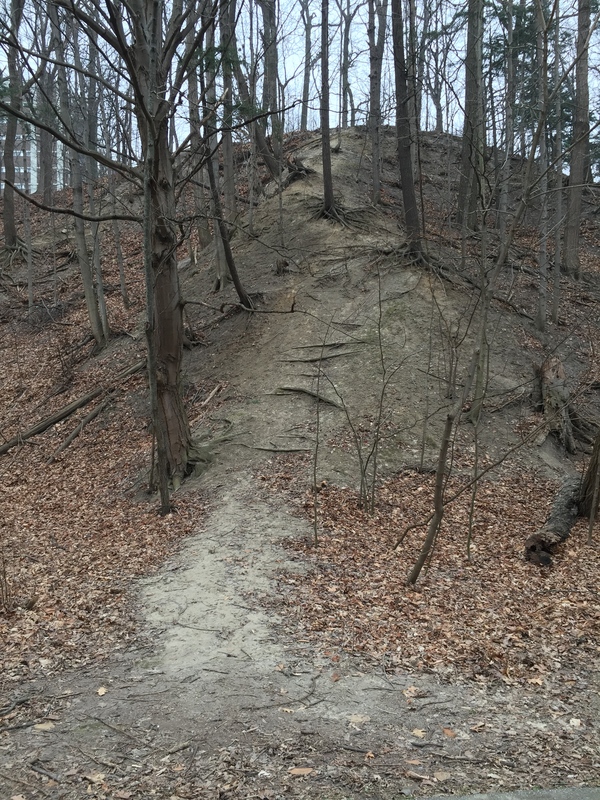 The park also has huge, steep slopes, and what looks like a lot of erosion. Many of the trees on the slopes have their roots laid bare. You can tell people have climbed up and down the slopes from the buildings at the top. Then there is the wildlife, like this strange, tiny bear I befriended. The mix of frozen ice and rushing water was really beautiful, with the water running under frozen sections creating almost psychedelic patterns as it pushed up against the ice over top. 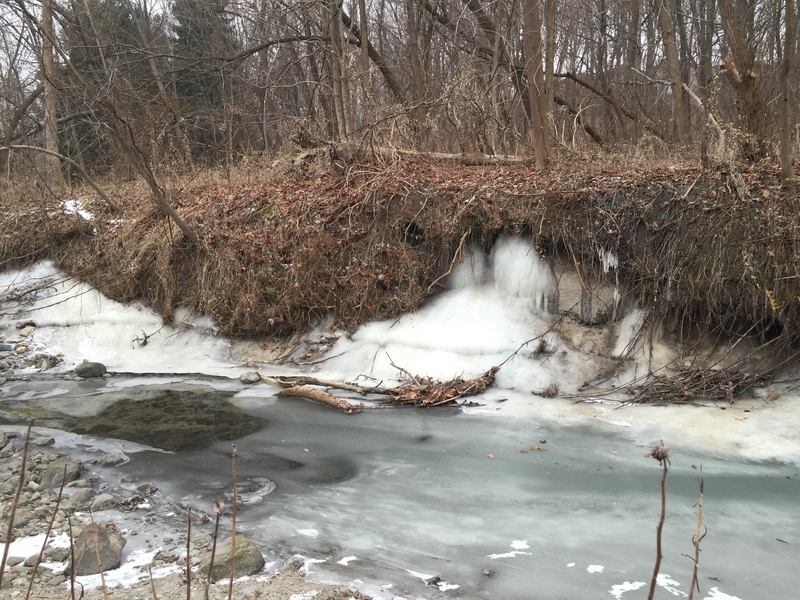 There was also a lot of ice build up along the banks of the creek, as if water had seeped out from the dirt there and frozen in big fuzzy masses. If there is one thing I could complain about, it’s the lack of seating. 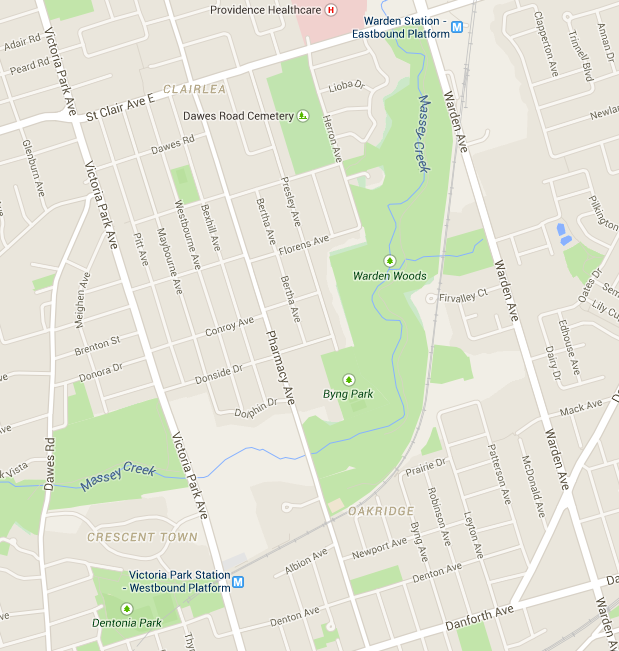 What is up with the lack of benches in Toronto parks? There is only one bench along the whole trail. The people want to sit! It also seemed to be facing the wrong way. I’d rather sit and look out towards the creek then back towards the trail. The ravine follows the subway line (or I guess I should say the subway line follows the edge of the ravine) so you can hear the rumble of the train every so often, but otherwise the park is quiet except for the birds and the creek. It was a good 30 minute walk, but I was going very slowly and taking pictures of spiky plants and small bears. This post is part of the City within a Park series where I’m visiting a park I haven’t been to in every one of Toronto’s 44 wards in 2015. This is the second post for Ward 35. You can find the other one here. You’re absolutely right about the lack of seating in public parks. This has bothered me for a long time. Our parks are designed to move people through them, while doing little to accommodate those who want to stop and smell the roses. Some of the parks in my ward (34) are massive, yet they contain maybe 2 or 3 benches. It’s no wonder they’re such dead spaces; save for those playing sports and dog walkers. It’s also an accessibility issue for me. If you aren’t able to walk for long periods of time for whatever reason, you should be able to sit down and take a break. Charles Sauriol Conservation Area, very similar to this park in size, location and layout, was recently upgraded and at that time the city must have listened because there are multiple sitting areas throughout the walkways and paths. Thanks for the tip. 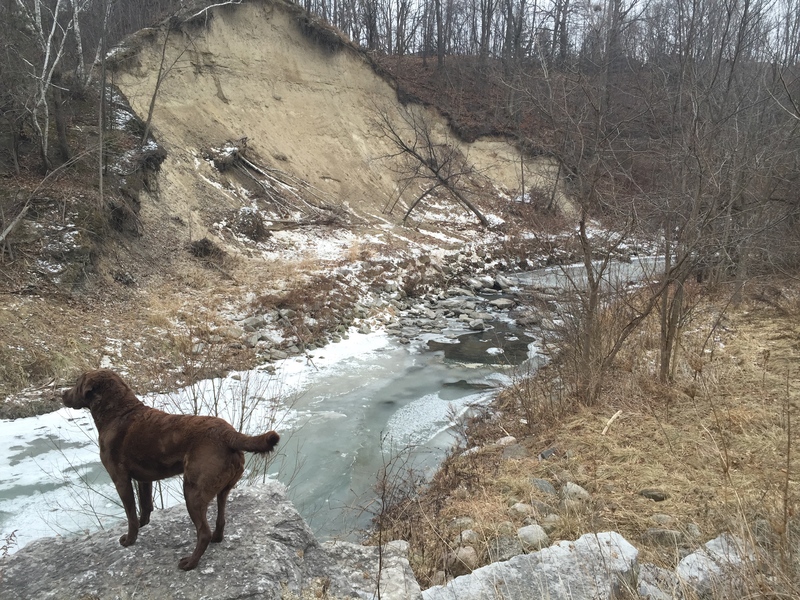 So many ravines to explore.